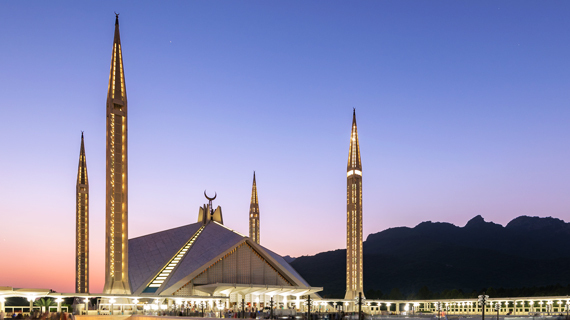 Islamabad – the capital city of Pakistan, is one of the most beautiful cities in the South Asian region. Wide, tree-lined streets adorn the various sectors and zones of the city, making it accessible and spectacular. A meticulously planned city by renowned town planners Doxiadis Associates, Islamabad is the fastest growing city in terms of population, economy and urban development. Idara Saqafat-e-Pakistan (Pakistan National Council of the Arts) runs two art galleries where contemporary Pakistani art is on permanent display besides revolving exhibitions & paintings available for sale. The other is Children Art Palace, where Children's art is on display and regular art classes held for children. The Lok Virsa Heritage Museum is the first state museum of ethnology that presents the history and living traditions of the people of Pakistan in a chronological sequence. It offers an enchanting journey through glorious civilizations of the past to the present day traditions. The museum has a large display of embroidered costumes, jewellery, woodwork, metal work, printing, ivory and bone work. Traditional architectural façade exhibiting such skills as fresco, mirror work, marble inlay, tile mosaic and stucco tracery from different regions of Pakistan. Lok Virsa Heritage Library is equipped with resource data on ethnography, anthropology, folk music, art, crafts and history. Books, video and audio cassettes/CDs containing documentaries on folk culture, folk heritage, folk and classical vocal and instrumental music are also available for sale at the Lok Virsa Sales Centre. The Museum depicts the early human history, geology, and the wild life of Pakistan. The exhibits are of particular interest to students and children. This 20,360 sq. meters rose garden is famous for its roses. It has 250 different varieties of roses as well as a dozen types of Jasmines. Flower shows are occasionally held here, particularly during spring. Shakarparian hills are situated near Zero Point, at a height of 609 meters. Its terraced garden offers pleasant and sweeping vistas of Margallah and Murree hills, Rawal Lake, Rawalpindi and Islamabad. Snack Bar facilities are available. Nestling at the base of Murree hills at a distance of 15 km on Islamabad-Murree road, TDCP Chattar Bagh recreational facility provides a quiet break from the hustle and bustle of the twin cities. Scenic walks, gently flowing stream, waterfall and the surrounding hillside are a perfect attraction. The resort has a restaurant, barbecue and two air-conditioned tourist cottages. The Children's Park and playground are spread over an area of 12.5 acres. A Sports Complex comprising Liaquat Gymnasium for indoor games and Jinnah Stadium for outdoor games has been built with the Chinese assistance. It is located on Shahrah-e-Kashmir near Aabpara. Regular national and international sports events are held in the Complex. Noorpur Shahan, a village situated at the foot of Margallah Hills, near Quaid-e-Azam University, is famous for the mirror-studded shrine of Hazrat Shah Abdul Latif Kazmi, popularly known as Bari Imam. The shrine was originally built on the orders of Mughal emperor Aurangzeb. The death anniversary (Urs) of Bari Imam is observed in the first week of May beginning Monday through Thursday with lot of festivities representing the Potohar culture and attracts people from all over the country. There is a cave in the Margallah Hills on the back of the shrine where Bari Imam used to sit for meditation. The shrine of Syed Meher Ali Shah of Golra Sharif is located 18 km from Rawalpindi, in sector E-11 of Islamabad. He was descendant of a Syed family and had links with Syed Abdul Qadir Gilani of Baghdad. He was born in 1859, preached and spread the message of Islam during the turbulent times in South Asia. He also wrote beautiful prose and poetry in Persian, Arabic and Punjabi languages, mostly in praise of God and Muhammad (peace be upon him). He died on May 11, 1937. His mausoleum was recently reconstructed comprising of a dome, and a high minaret built with marble. Saidpur, a little quaint village, famous for its pottery, is part of Islamabad today. Sultan Said Khan son of Sultan Sarang Khan founded Saidpur. Saidpur was considered a garden resort and a perpetual spring provided water for drinking and for watering gardens around during the Mughal period. About 30 km from Islamabad lies Simli Lake and the Dam. It can be reached via Lehtrar road or via Bhara Kahu. It is fed by the melting snow and natural springs of Murree hills. The water stored in the lake is supplied to Islamabad for drinking purposes. Angling and boating is also allowed in the lake.